Samsung and Nikon have changed the game and instead of a good camera in a phone have put a mobile OS in a camera. Here is how the two stack up against each other based on features. Nikon became the first to launch a camera with Android operating system and Samsung followed soon with a full-fledged Android device with 3G connectivity in a camera. While Nikon is cheaper by around Rs 10,000 with a Rs 20,000 price tag, Samsung has gone the whole hog and put really powerful specs for a tablet in a point and shoot camera that looks powerful on paper, but is also priced much higher at Rs 29,990. Nikon was the first to launch a camera with Android operating system and Samsung followed soon. Both cameras use a 16 megapixel sensor, but while Nikon offers 10x optical zoom, Samsung is offering 21x. Samsung gets a f/2.8 aperture and 23 mm-480 mm lens, while Nikon gets f/3.2-5.8 aperture and a 25-250 mm equivalent lens. Both the cameras offer only a screen and no viewfinder, and in that sense again Samsung outscores with a larger 4.8 inch screen compared to the 3.5 inch screen of the Nikon. While both cameras offer a lot in terms of features, like geo tagging, face detection, motion detection and stabilization, Nikon's camera, according to reviewers, is slightly better in terms of image quality but the difference is not much since Samsung offers very powerful zoom and good editing capability. Nikon has used Android 2.3 operating system, which is very old compared to the Android 4.1 on Samsung. However, Nikon has done a good job of integrating Android 2.3 and most apps from Google Play work on the camera; but so has Samsung done a good job with the OS, and since it is the latest version of the OS you get a much better experience, which gets even better with the bigger, better screen of the Samsung Galaxy camera. Samsung has also gone the full distance in putting the hardware that will put to shame some of the standalone tablets with a 1.4 GHz quad core Exynos processor coupled with a Mali 400MP graphics processor, 1 GB of RAM and 8 GB internal storage. Samsung has also supplied a 1650 mAh battery. Nikon, on the other hand, pales with a 1050 mAh battery and a 1 GHz processor, 512 MB RAM and 4 GB internal storage. And though the operating system is very stable, the whole experience would certainly be better on the Samsung Galaxy camera. The bigger screen on Samsung can make this camera a tablet replacement for someone who is more keen on a camera as it will not just enable better editing and sharing of photos, but will also offer sufficient room for browsing and playing games, and some productivity apps as well. On the connectivity front too Samsung is much better with 3G SIM support, apart from WiFi and GPS, though there is no voice calling support. Nikon, on the other hand, offers only WiFi and GPS. While Nikon has in a way done better by not putting too much phone hardware in what is essentially just a better connected camera with the ability to edit pictures on the go, the cost differential with Samsung Galaxy camera is not too much. This might mean that many people who are keen on a camera that offers easy sharing and editing will sway in favour of Samsung. A camera that can also be used as a tablet, without much compromise, will also offer good gaming and editing capability thanks to a powerful processor and GPU. 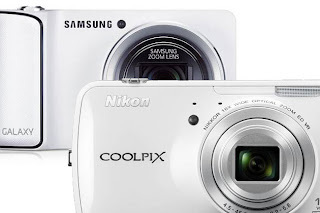 Since we have not reviewed Nikon Coolpix S800c and have only used Samsung Galaxy camera for a short while, we are not in a position to judge the two on their picture taking ability. For those who already own a tablet or a smartphone, you can look at buying a good camera instead as you will be able to buy a way better camera for that money and you can anyway transfer pictures to your phone and tablet easily with the supplied cable, and enjoy the goodies that these two offer in terms of the mobile OS. We expect that this category will soon have more products and will offer much better choice at a much more reasonable price point, as for us both these devices are a bit over priced right now.